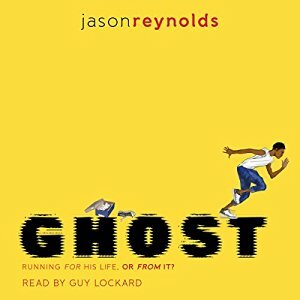 Ghost by Jason Reynolds, narrated by Guy Lockard. Grades 5-7. Atheneum, 2016. 3 hours, 29 minutes. (192 pages.) Audiobook provided by my local library. Castle Crenshaw calls himself Ghost and he knows he can run fast. Unfortunately, he knows this because of a terrible night when his dad got drunk and violent and running fast was the only way to get away. Life hasn't been super kind to Ghost - the kids at school make fun of him because he's poor, and he carries around the weight of his father's betrayal. One day, Ghost stumbles onto a local track team practicing near his neighborhood and starts to watch. Those kids think they're so fast, but Ghost knows he can leave them in the dust. And when he shows off for those kids, Coach is watching him and invites him to join the track team. Ghost has never done anything like that before. And he's never had a strong guy in his life to show him the ropes. Suddenly, Ghost is learning what it's like to be on a team, to have a Coach who really cares about him, to work at something and get better and feel proud. To stay on the track team, Ghost will have to steer clear of what his mom calls "altercations", which is not going to be easy. When kids start running their mouths and saying stuff about him, Ghost can't keep calm, he has to fight back. But he'll have to really watch it to keep doing what he loves. And then Ghost makes a decision. A bad decision. A decision that could cost him his track star dreams. Will Ghost lose the best thing that has ever happened to him? If you like realistic stories, especially if you're into sports, pick up Ghost. Oh man, you guys. THIS VOICE!!! Jason Reynolds is a master of voice and dialogue. His characters jump off the page with their realness. I could completely and totally believe that Ghost was a real kid who was sitting down and telling me the story of his life. If you have readers who enjoy strong, well-written voice (me, me, me! ), push this book into their hands. The narration of the audiobook absolutely heightens the story, too. Guy Lockard brings out every ounce of humor and tension in the story. His fully voiced performance did justice to the strong voices of the characters in the book. The words and voice of Coach, a taxi-driving curmudgeon with a heart of gold, are still stuck in my head, weeks after listening to this audiobook. This book was a finalist for the National Book Award and I'm expecting to see some more shiny stickers on it, come awards season. After I finished this audiobook, I immediately picked up Jason Reynolds's and Guy Lockard's other middle grade audiobook out this year, As Brave as You, which is also really good. Again, I think audio is the way to go with this title and Guy Lockard gives a masterful, fully-voiced performance. For readers who like the storyline of a kid dealing with Circumstances in the city, I would suggest Kinda Like Brothers by Coe Booth or Ghetto Cowboy by G. Neri. For readers looking for more sports stories, I would suggest The Crossover by Kwame Alexander (yes, again, I love this book! ), Sasquatch in the Paint by Kareem Abdul-Jabar, or Izzy Barr, Running Star by Claudia Mills.